The Hamilton air monitoring network (HAMN) is a combination of continuous real-time air pollution monitoring stations and non-continuous air pollution monitoring stations. Continuous Hamilton air quality monitoring provides access to the HAMN network's most current hourly air quality data. Non-continuous monitoring requires collection of samples and then carrying out the required laboratory analysis. This air quality data will be provided in report format. 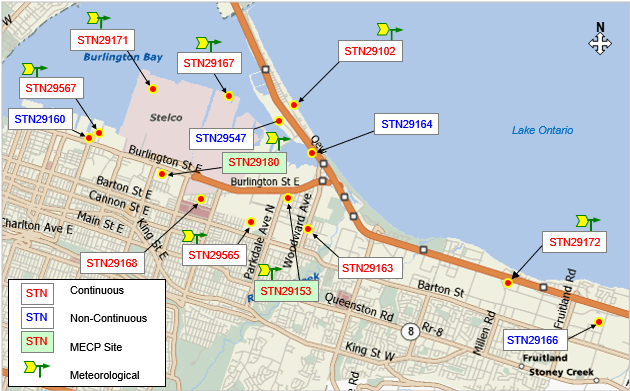 The table below lists Hamilton's air monitoring station locations and the parameters measured at each site. The map below identifies the sampling locations.